The Linux Foundation is organizing a collaborative effort with 13 tech companies to promote open source software and standards for cloud object storage technologies. Among those supporting the new Kinetic Open Storage Project are founding members Cisco, Cleversafe, Dell, Huawei, NetApp, Red Hat, Seagate, Toshiba and Western Digital. 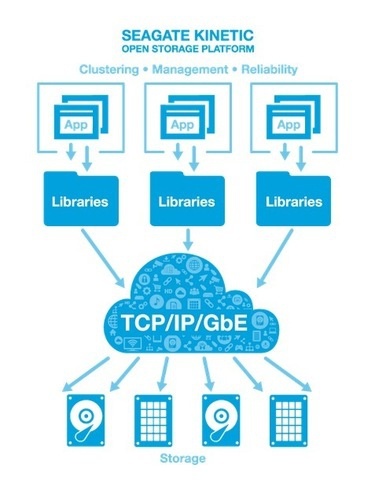 The effort is aimed at promoting Ethernet-based storage technology with open source software and standards to address the fast adoption of cloud, virtualization, and object-based storage. An example of a "Kinetic Open Storage Platform" where applications access drives via Ethernet. "Storage technologies are becoming increasingly complex as the cloud, virtualization and container technologies converge. Open source software and standards can speed the evolution of storage technology to support these areas," Jim Zemlin, executive director of The Linux Foundation, said in a statement. "The Kinetic Open Storage Project will allow industry leaders to address new challenges head on and support rapid growth through a community-developed protocol specification and libraries." Object-based storage addresses a world of unstructured data where pictures, movies, e-commerce, games, and archives are all searchable through metadata or descriptive data. In the new storage paradigm, information is stored, read and deleted but never modified. The Kinetic Open Storage architecture is inspired by the scale-out data center in which Ethernet and Linux are ubiquitous, open source software reduces barriers, and hardware becomes more commoditized. "Linux is an open source software that has been widely used by many companies’ products. No one would like to adopt proprietary software due to lock in [with a] specific OS with potential higher prices," said Fang Zhang, an analyst with IHS. "Also it is not easy to integrate to other products. The open source of Linux is also easy for develop for future development." Software-defined, object-based storage has been fast encroaching on the traditional paradigm of hardware-centric, file-based systems. In essence, hard drives and SSDs get their own IP-addresses. "Increasingly, systems and data centers are designed for capacity rather than performance," Seagate said in its own "Kinetic Open Storage Vision" statement. Ethernet-based storage, such as Kinetic hard disk drives announced last year by Seagate, can eliminate the need for storage servers, allowing applications to directly access drives. Seagate's HDDs are based on its own Kinetic Open Storage platform; the Kinetic HDD operates using the Swift OpenStack Object Storage protocol. The Kinetic platform allows servers and storage to be scaled independently. Cloud data centers can add servers and storage at entirely different rates, matching each precisely to their needs, Seagate has said. Because Ethernet has become the de facto fabric of data centers and application traffic, it has emerged as the backbone of storage infrastructure. "This can be seen by the phenomenal growth of virtual server and desktop infrastructure, as well as the rampant adoption of Amazon Web Services to validate this latter point," Seagate stated. More about Amazon Web ServicesCiscoDellHuaweiIHSLinuxNetAppRed HatSeagateToshibaWestern DigitalWestern Digital.